For the past fifteen years, my entire extended family (wife, kids, parents, sisters, nieces) have spent at least part of the summer together in our shared house in Prince Edward Island, Canada. Even though we are now living in Japan, we were not going to miss it. At the very end of July, my wife, my two kids and I boarded a flight that took a good 35 hours to meander from Tokyo to Hong Kong and finally to Boston where we landed. This was but a prelude to another 14 hours that would be spent driving up the Eastern Seaboard, through the thickets of Maine and New Brunswick, to finally be spit out at the base of the graceful, winding Confederation Bridge linking PEI to the mainland. A long journey, but really a minor price to pay. It was our first time back to North America in a year. Prince Edward Island is perhaps my favorite place on earth. It doesn’t have the majestic, wild beauty of neighboring Nova Scotia and Newfoundland. PEI is defined by a sense of gentleness, of peace — rolling hills, small farms, red cliffs leading to empty beaches, extended sunsets reflecting off the Gulf of Saint Lawrence. The air by our home is scented with wild thyme, roses, bayberry and seaweed. My family breathed a long sigh of relief when we arrived. We shook off the oppressive, record-breaking heat of our first Tokyo summer and settled into a wonderful vacation. A year away has felt like nothing for me. For my children, it may as well have been a decade. My son left North America in the first blush of puberty. He returned five inches taller, his voice a few octaves deeper, the beginnings of an inauspicious mustache sprouting on his upper lip. Surrounded by his grandparents, cousins, aunts — who truly missed him — he was as free to embrace his new maturity (acting surly, helping my 89-year-old grandfather to the beach, reading Hate comics, building metal shelves for my mother and eating – and shucking! – many, many raw oysters) as he was to spend hours skipping rocks, making sand forts and just being the little boy he still is. Like greedy children we all scraped every tiny bit of pleasure from our trip — even managing to return to Brooklyn for a few days to see friends, eat some delicious things and go food shopping before heading back to Tokyo. The danger of such a nice vacation — of being back on familiar ground, surrounded by family and old friends — is that it exposes the fragility of our new life here in Tokyo. For a year I have been the most enthusiastic cheerleader for Tokyo, and yeah…I have become a bit strident in my anti-Americanism…Sooo… maybe we haven’t adjusted to Japan as well as I thought? Maybe we aren’t as “at home” here as I keep telling myself? Maybe the whole move to Tokyo was a terrible idea and I have caused great misery and unhappiness for my wife and kids? Perhaps everyone that I love will resent me forever and I will spend my remaining years living alone in an S.R.O. in Cincinnati. These are the thoughts you have after 8 hours in a cramped economy seat, unable to sleep and having watched all the “good” movies on the Tokyo to Boston portion of the trip. Also, you fear a fatal blood clot…but that is for another post. So it was that we returned to Narita Airport. From a cab window from Ikebukuro to our home, I found myself in the familiar role of being gripped with curiosity by streets as yet unknown to me, shadowed alley-ways promising amazing izakaya, ramen shops with lines of construction workers. A few more turns of the wheel and I realized I knew the street we were on, knew the man who ran the vegetable store. We were greeted at home by my mother-in-law with an enormous spread of sashimi and rice so perfectly cooked that I realized I had been lusting for it all month. Their horrible dog did not seem so horrible. The house did not seem as small nor as shabby as I had remembered. I was, I realized, happy to be home. My family? I was not so sure. The next days were enveloped in the fog of jet lag. Waking at 2am. Falling asleep while waiting for lunch. My son seemed to be suffering the most. Wistful. Sighing. Staying in sweat pants all day long. I forced him out of the house for ramen, just to see if some springy noodles would break through to him. They did. Somewhat. On Friday, the doorbell rang and the neighborhood “boss” (I don’t know what else to call him!) was there to tell us that Sunday was our local “Mikoshi” and we were, once again, invited to participate. The Mikoshi is basically a portable shrine, a divine palanquin holding our neighborhood deity. It is shaped like a miniature house, decked in gold and attached to thick, square cedar poles to be rested on shoulders for transport. Once a year it is brought from the main shrine, celebrated and taken for a walk around the hood. It is a ceremony that is mirrored by the Catholic traditions of taking certain statues or icons out of the church and into the secular world. The Mikoshi is heavy. Way heavier than I thought it would be when I first carried it last year. 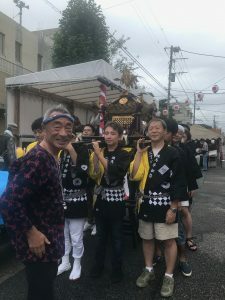 The tradition is also to show the deity a good time, so the Mikoshi is bounced up and down so that the cedar poles crash into the shoulder creating horrible bruising and welts that last for weeks. In some of the older, more dense parts of Tokyo, the Mikoshi can be pretty intense. Thousands of people come out, the streets are jammed and alcohol flows freely. Occasionally two shrines will travel down the same narrow street going in opposite directions and with drunken machismo and neighborhood pride on the line, chaos will ensue. Critical injuries and death are rare, but not infrequent. Sunday came around, and although it was grey and had been raining, the clouds parted for a moment. Our corner of Heiwadai is very residential, mainly single family homes. Concurrently, our Mikoshi is pretty small, pretty relaxed and very very safe. A small stage was set up on the street in front of the Heiwadai Children’s Center with traditional Taiko drummers doing their thing and a few women doing traditional dances. Tables were selling yaki-soba, cucumbers on a stick, freshly popped popcorn. The kids were given complimentary bags of junk food — old school, unadorned 1970s junk food proudly flaunting empty calories, refined corn syrup, sodium, fats, air, and MSG. In 2018 Carrol Gardens, Brooklyn, this bag would get Child Services at your door. They also sell Ramune — which is heavily sweetened, almost cream-soda tasting beverage that is only for kids. It is capped with a clear marble that you punch down into the soda — In the USA, this would be known as Instant Death Law Suit Soda and you would know scores of children who choked on the marble and died. In Japan, it is the rage for kids of all sizes at any festival. The neighborhood elders greeted us. Asked about our vacation, commented on how much my son had grown and gave us the traditional Mikoshi wrap-around shirt to wear. My daughter and son go to the children center pretty much every day ( its free and well-appointed with a nice staff, a library, basketball courts and an art facility) so they greeted their friends from there, showing off their tans and growth spurts in typical anywhere-in-the-world-back-from-Summer-vacation-vibe. Some of the adult staff rough-housed with my son, obviously glad to see him. He laughed, cracked jokes back to them, his Japanese now fluent, expressive — able to transmit his personality in a way he struggled with when we arrived a year ago. I was seeing a different side of him; a side that exists outside of me — an independent guy finding his place in the world. Not such a little boy anymore. One of the staff caught me staring at them, and I think mistook my look as concern and apologized to me for being rough…I did my best to say NO NO! Please go ahead, rough him up, it warms my heart to see! Because I remember that so well from my own youth — the karate teachers who discovered an inner toughness in me, a smoldering anger that my parents did not yet understand. They didn’t treat me as a little kid at all; in fact they beat the hell out of me and respected me for absorbing it and fighting back. It was not a macho thing – I was just so happy that someone was seeing me as an individual, the pain was worth it. My son told me he wanted to carry the Mikoshi for his first time. Soon it was time to begin. About ten of us, including my son, gathered around the shrine and hoisted it up on our shoulders. In front of us a gang of people, kids, grandmothers, my wife and daughter pulled a large drum, beating on it. We followed, the pace brisk. One of the elders, dressed in a special red shirt and blue head band led us, keeping a beat with a whistle and two wooden blocks. Other elders circled us, waving fans, keeping our direction true and leading the call & response chants of “WASHOI” as we tried to find a rhythm to our shuffling steps. My son was in the front, I in the back. We walked up and down the winding streets, people standing in front of their houses cheering and offering donations. After 20 minutes or so, the drums broke into a fast roll, we stopped marching, bouncing the Mikoshi as high as it could go and finally rested it upon some saw legs as we took a break. Beers were everywhere. Popsicle and soda for the kids. I watched my son eat a blue ice and then a popsicle shaped like a slice of watermelon. Our leader cracked open an Asahi and handed it to me as I noticed his hands and legs shaking. “I feel bad for that guy,” my son said when the man was out of earshot. “I think he has Parkinson’s.” Yeah. But, he seems to be pretty happy today, doing what he wants to do…right? I did not ask how he knew what Parkinson’s was. We traded notes. Did his shoulder hurt? Nope. Like me, neither of us was getting the weight of the Mikoshi. In fact, I was having trouble finding a good position without stepping on the heels of the guy in front of me. We started off again. Traversing the small streets before temporarily stopping traffic on one of the hood’s largest boulevards as we turned a corner. My marching was getting a bit better, I felt a little more on time, but I still was not catching the weight properly and felt somewhat useless. A Mikoshi pretender. We took our second break. More beer. More popsicles and soda for the kids, which no parents seemed to mind at all. There was an announcement: We would march for another 30 minutes, returning to our starting place where there would be more bags of snacks and sugary things for the kids. This time my son and I were next to each other, in the back, and when we lifted the Mikoshi I felt the weight firmly on my shoulder. We headed off, everyone a little buzzed from the break-time beers, the pace a bit quicker, the call and response of “Washoi” louder and more aggressive. With no one ahead of me, my stride was un-constrained and I caught the rhythm better. My son’s voice echoed beside me, his feet mirroring mine, the cedar planks burrowing into the meat of my shoulder. We delved deeper into the neighborhood, the twisting streets oddly unfamiliar as I lost my sense of direction. Without even noticing, I had fallen into perfect lockstep with my Mikoshi crew, my voice indistinguishable (even to myself). My shoulder throbbed in time with my feet. I sensed the reverberations of the ritual, the hundreds and hundreds of years of energy traversing these streets. A weird euphoria took me. If another Shrine came around the corner, we were not going to stop. I caught sight of my son and he was right there with me — a sort of determined, loopy grin on his face. “You need to do post about this!” he yelled. Eventually we returned to the Children’s Center. More snacks, more sugar, more beer were passed out. The Mikoshi was safe and sound and our deity was hopefully re-energized for another year back in the shrine. As if on cue, the rain started drizzling again. We handed back our jackets, my son getting congratulations from the elders for his debut. Our shoulders hurt, but not too bad. With a blue popsicle dripping down his wrist, my son and I walked back. To our home.